Flash floods in Afghanistan's Kabul province have killed 22 people, officials say. The flooding hit a village in the Shakardara district following a weekend of heavy rain, a disaster management official told the BBC. Many of those who died are thought to be women and children. Many families had gone to the district, known for its vineyards and apple orchards, to celebrate the Muslim Eid al-Fitr holiday. Reports say most of the victims were in cars which were submerged as the floods hit. The floods also destroyed homes, agricultural land and fruit gardens, officials say. "We are still trying to rescue people and look for those people who are still missing in the floods," Afghan interior ministry spokesman Sediq Sediqi told Reuters news agency. 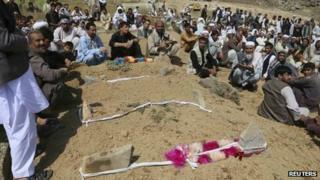 Earlier this month, dozens were killed in Afghanistan and neighbouring Pakistan after a storm system caused torrential rain, washing away homes and destroying summer crops.